This is a great Red light source for Acne scar treatment. This treatment has shown to be very effective for correcting Acne scars. This Bulb has over 38 Red LEDs (Light emitting Diodes) and it is very powerful. It has the same purpose as the Photon mask I reviewed here, the biggest difference is the price and shape of it. If you are on a budget and still want to benefit from Red light therapy this bulb is the way to go. Let us review the effects of the light. Red Light (660 nm): Has shown to reduce wrinkles, make the skin smoother, help blood circulation, help in the creation of collagen and reduce the size of pores. Remember the creation of collagen, so that our skin begins reshaping is the most important aspect of scar healing, of course eliminating wrinkles and making your skin smoother is a nice bonus. This light bulb has a lot of Red LEDs, so it is very strong and enough to cover your entire face. You plug this Bulb into any lamp socket and just point the light towards your face for 20 minutes, very simple. 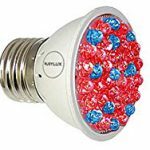 Great Reviews in Amazon, great price for the number of LEDs available. This is a great budget Scar treatment, but if you have the extra money you can go for the Photon mask I mentioned above, but using this product is good too. You also get free UV goggles, since you do not want the light pointing directly at your eyes. With the photon mask this isn’t necessary since the mask has shielding around the eyes. Always, remember to always wash your face first, this will make sure there is no dead skin that could block the light from entering your skin. These are scars we are healing, so you will not see results right away, this treatment takes patience and time, you will notice your skin is very smooth once you finish the treatment, but it will take a few months before you see real permanent results. There has been some small research that suggests that Red light can make your thyroids act up, while this isn’t proven, better safe than sorry, I usually wrap a towel around my neck and collar bone, so there is no light hitting my thyroid. The Red LED Bulb is an excellent product if you want to try LED based scar treatments. The Photon mask is pretty good, but this is still a great price conscious way to get you started on this type of treatment. The research is there and the results that many people like myself are getting speak for themselves. Isn’t time for you to get results as well? 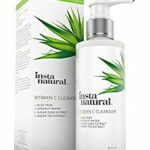 If you have any questions or comments, go for it and I’m sure this product will help you on the path to Beautiful Clear Skin. Hello, this actually looks pretty interesting, I don’t have much acne, so this bulb makes perfect sense if I just want to deal with my scars, since I don’t want to spend too much money. Thanks for the insight. It does, if you’re not too concerned about acne and do not want to spend too much money in an acne scar treatment, this is the product to start using, thanks for reading. Hello, been only a couple of months, but wanted to report and tell you I’ve been getting great results, my skin is smoother and more flat, might go for that mask, thank you so much for the tip! Wonderful news! yes, if used consistently you will noticed some great results and investing a little more on the mask will make it more comfortable to use and much more efficient, thank you for the update it makes me happy to hear people are getting results, thanks for reading. Thank you for this article, I’ve been struggling with acne scars for a few years now, so I’m very interested in this red light lamp. How does it actually work on scars? Do you have any before/after pictures? Is this treatment actually safe for your face? I’m really excited and would like to get more info about it since I’ve never had red light treatment before. Hey Soby, light at 650 – 660nm wavelength or better called a Red light has shown to increase the production of collagen on the skin which is what helps heal and reshape the skin. It also reduces the size of wrinkles and the same process of collagen production helps reduce wrinkles. It does work! I will be writing an article about scars soon and will sure to include some of my pictures before these treatments and after. There are no side effects to this light at all, you just need proper eye protection which is included when you purchase this bulb. If you want something more comfortable I always recommend the Photon Mask. There is plenty of information on the site and I’m always happy to answer any questions, thanks for reading. Very informative post you shared on this page about removing wrinkles, seems like an interesting product and I appreciate the tips and tricks on how to use this best. I’m trying to find something not invasive to deal with my wrinkles, I will give this a try and see and will be sure to cover my neck, thank you very much. This product is fantastic for wrinkles, it is certainly not invasive and very safe. I like giving tips and tricks to make it easier to use the products, I’m sure it will help you, hope you try it, thanks for reading.